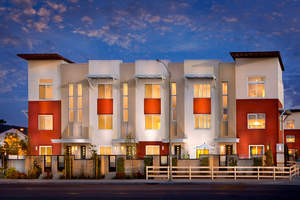 LAKEWOOD, CA--(Marketwired - Jun 17, 2015) - Canvas by William Lyon Homes is now selling, giving first-time buyers an incredible opportunity to have a home to own with brand-new row-inspired townhomes priced within their reach. Set in a convenient Lakewood location, this stylish attached home collection is perfect for young professionals and couples with its contemporary architecture, well-appointed floorplans, appealing features including a versatile bonus room, and attainable prices starting from the low $400,000s. To see how good homeownership will look on you, visit the Canvas Sales Gallery today or log on to www.LyonCanvas.com for more details. "With sales underway, we're seeing a tremendous amount of interest from first-time buyers who had no idea they could own a brand-new, quality-built townhome in such an accessible location," said Lesley Pennington, Vice President of Sales for William Lyon Homes. "If you're ready to say goodbye to your landlord and experience the rewards of homeownership, visit the Sales Gallery today to learn more about Canvas." Canvas' collection of 3-story attached homes feature spacious designs ranging from approximately 1,647 to 1,801 square feet, with 2 to 3 bedrooms, 2 full baths and 2 powder baths, bonus rooms and direct-access 2-car garages. In addition, buyers will value the confidence and quality that come with any new construction by William Lyon Homes. Set conveniently near Long Beach in commuter-friendly Lakewood, residents will find Davenport Park, Lakewood Country Club, Lakewood Golf Course, Mayfair Park and Pool and several other recreational destinations all nearby. Canvas is close to Lakewood Center stores, including Costco, Best Buy, Macy's and Target, as well as the Long Beach Towne Center's outdoor promenade, theater, restaurants and shops. Other attractions include Downtown Long Beach, The Pike at Rainbow Harbor, Belmont Shores and the famed Aquarium of the Pacific. Medical services are accessible at the Lakewood Regional Medical Center. It matters who your builder is and William Lyon Homes is a company built upon a legacy of pride and integrity. A team of visionaries who are passionate about homebuilding and committed to providing a high quality homebuying and homeownership experience, William Lyon Homes has earned a solid track record for outstanding construction and customer service since 1956. The company continues to expand its well-respected brand beyond California, Arizona and Nevada and into other market areas across the Western region with the acquisition of Polygon Northwest Homes, its newest division in Washington and Oregon, and its Village Homes division in Colorado. William Lyon Homes shares are publicly traded on NYSE under the symbol WLH. For updated information and to learn more, visit www.lyonhomes.com. To visit Canvas, travel the 405 Freeway, exit Lakewood Blvd., and head east. Turn left on E. South St. and follow the signs to the Sales Gallery, which is located on the left hand side. The sales gallery is open daily from 10 a.m. to 6 p.m. For more information, please call 562.470.7404 or visit www.LyonCanvas.com and register your interest. Homeownership is within reach at the brand new Canvas neighborhood in Lakewood.